Virtual Harlem: The Virtual Harlem Project is a virtual representation of Harlem, NY as it existed during the 1920s Jazz Age. This project is one of the earliest full virtual reality environments created for use in the humanities and certainly one of the first for use in an African American literature course. Originally conceived while completing my doctoral studies at the University of Missouri-Columbia (UCM), Virtual Harlem has both grown and matured over the years. In 1996, a newsletter distributed to the faculty, staff and graduate teaching assistants at the university called for proposals to make use of a new technology called Virtual Reality. Of the hundreds of faculty at UCM, only two submitted proposals along with mine describing my vision for Virtual Harlem. The project was originally proposed as a representation of a portion of Harlem, NY as it existed during the Harlem Renaissance/Jazz Age. The digital environment contains iconic locations like the Cotton Club, the Apollo Theater, Marshalls Hotel, museums, art galleries and the Harlem Branch Library. In addition to these famous locations, there are also interactive elements, collaborative possibilities, music of the period and opportunities for students to create projects related to the period and to role play. The first version of this project was created to be displayed in CAVE environments located at UCM and at other locations in the United States and other parts of the world. Wearing 3D glasses and in some cases, virtually surrounded by virtual characters and buildings, visitors to the environment had the opportunity to interact with one another and the space itself. The Virtual Harlem Project has been presented at venues in Paris, The Netherlands, Sweden, Hungary, and multiple sites in the US. In 2004, the University of Paris IV-Sorbonne, funded the development of Virtual Montmartre and I was asked to be the project leader and was awarded the prestigious "Professeur Invite" from the Sorbonne to spend 6 months in Paris. This project realized itself in the development of an interactive Web Site and a small 3D recreation of the Lapin Agile, the oldest surviving cabaret in Montmartre which is still in operation. The relationship to Virtual Harlem is clear to scholars of the Jazz Age/Harlem Renaissance, for it was in this Arrondisement in Paris, the 18th, that Jazz was introduced and popularized in Europe by African American troops who fought under the French flag in World War I. The evolution of Virtual Harlem was funded in 2006 by the National Black Programming Consortium and the Government of Norway with the development of Virtual Harlem and Virtual Montmartre in Second Life. Currently, the Virtual Harlem Project includes both of these locations. In Second Life, The Virtual Harlem Project (now a combination of Virtual Harlem and Virtual Montmartre) blossomed. Through collaborations with academics, students, residents of Second Life, entertainers and artists, The Virtual Harlem Project has taken on new life. There are currently a variety of projects ongoing such as the development of an interactive game, a very active artist community with real-life artists displaying their work and conducting exhibits and presentations, jazz artists conducing live concerts, students actively working on course projects like museums and artists appreciation exhibits, tours and discussions. We even explored the use of Automated Agents portraying historic figures as a way to incorporate interactivity and offer information about the period. 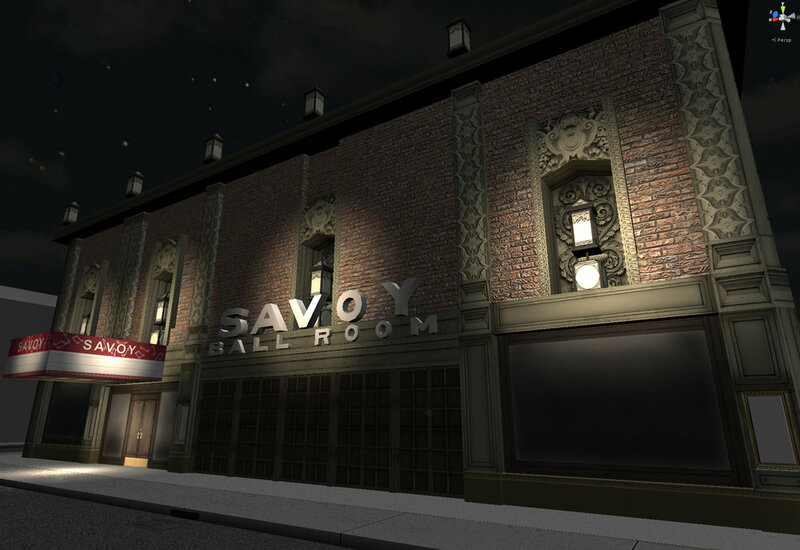 In the Fall of 2012, the Virtual Harlem Project was ported to Open Sim. This was done for two reasons. First, the cost of maintaining environments in Second Life became extreme when Linden Lab eliminated the 50% educational discount which made it very difficult for many educators to justify the cost of one Sim, let alone two. Secondly, moving to an open source alternative seemed prudent. The project is currently housed at the University of St. Andrews. This collaboration is very exciting and we expect to incorporate a number of advanced features over the next year. Feel free to visit Virtual Harlem and Virutal Montmartre, explore, engage, collaborate and most importantly, experience the period in Open Simulator. Coming to Unity 3D soon!! Download the Curio 3D Web Browser and launch it. Be aware, it may take some time for the first launch as it is downloading quite a few assets. Explore this Alpha Version of Virtual Harlem in Curio and Unity 3D. This is an evolving project so you should notice changes over the upcoming months. To this end, many of these tools not only enhance the learning experience but also address many different learning styles with which our students enter the classroom. Additionally, these tools foster an opportunity for international collaboration that is much more difficult to accomplish in a traditional classroom setting. Please check my Digital Humanities Tools page here to see some examples of the tools I currently use.